Hello My Friends! 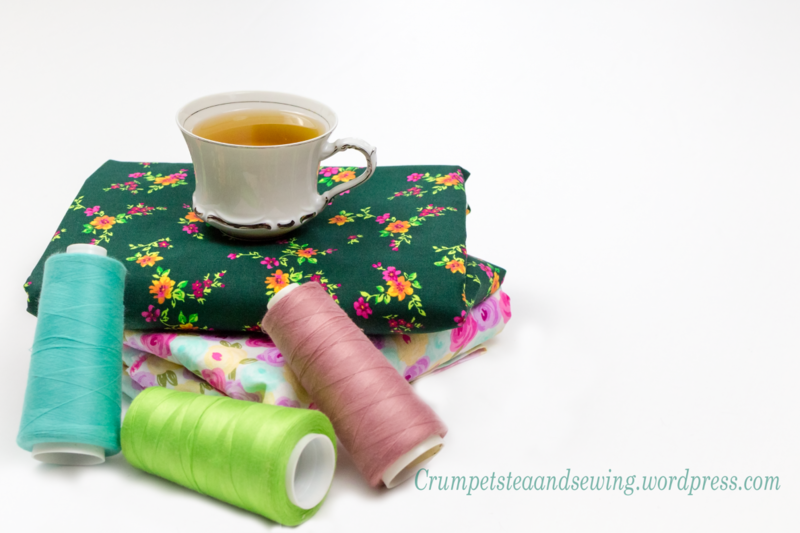 I’m Tea with Crumpets, Tea, and Sewing! This is my second blog post on this site, and I have decided to share my fabric haul from previous years and some of my sewing plans for 2018, including a list of my #makenine2018. As of now, my YouTube channel does not have any content on it. But I plan to update and add videos to my channel soon, so lookout for a video of future fabric hauls, sewing tips and ideas. It is important to note that, I did not purchase the fabric for my 2018 upcoming projects all at once. Many or most of these fabrics were accumulated over time, and several I had over 5 years or more. I did not always have time to breakout my sewing machine and immerse myself in long or tedious projects until quiet recently (2014). This past year has brought new challenges for me and opportunities to enhance my knowledge and skills as a seamstress. Hence, the new Instagram, Facebook, and blog accounts are inspired by my initiative to delve deeper into my creativity and passion for sewing and to share my knowledge and creativity with the sewing community. I am sharing some of my favorite vintage type fabrics that I have collected over the years. Because I have a huge collection of fabrics, I am only going to show some of my favorite fabrics that I have collected over time. I will also do a fabric haul post about my 2018 sewing plans and my #makenine2018 sewing projects. Since I plan to specialize in making vintage apparel, majority of the fabrics that I will share in this post will have that floral midcentury aesthetic appeal. However, I also love the Ankara African fabrics and have a few of those in my collection as well; so, I will share my plans for those fabrics. So, without further ado, here is a generous list of my fabric haul over the years. Below is an image of a soft blue and peach lightweight rayon fabric. I purchased 2 yards of this at a local thrift shop here in Racine, Wi. This piece cost me $4.00. Since it is only 2 yards of material here, I will most likely make a blouse or use it as a lining in a vintage jacket. 2. The blue leopard rayon fabric, I purchased from Joann’s Fabric from the “red tag” section. It was priced at $3.00 yd, and was an end of bolt piece. It only had 2 yds. of fabric remaining. I do not have any concrete plans for this piece; however, I like the idea of making a flowy 1940s dress with a gathered midriff . I think this would be fun! I also think it would be a really cute blouse. 3. The blue and brown floral cotton print is a 100% Keepsake Calico print. I purchased this fabric from Joann’s Fabric; it was also a clearance, red tag item. It was about $3.00 yd. I purchased this fabric twice. The first time I saw this fabric, I immediately fell in love with it. I purchased 2.5 yards of it. After searching my pattern stash for ideas on what to make with this fabric, I realized that everything I wanted to make called for at least 3.5 – 5 yards of fabric. About 3 weeks later, I went back to Joann’s to see if the fabric was still in store. I was extremely happy that it was still there! I then purchased 3 additional yards of this fabric. I love everything about this fabric. I love that it is 100% cotton, blue and brown, and a keepsake calico design. In addition, this fabric streams vintage! I will most likely make a really cute gathered or pleated dress. I purchased some light brown/tan-ish colored buttons to add as a decorative feature on the bodice. I’m really excited to sew with this fabric. 4. The Pink, purple, blue, and yellow floral cotton print. To be honest, I was really on the fence about purchasing this fabric. But when I realized that it was $1.25 yd., and a keepsake calico print, I immediately threw it in my cart. I found this adorable fabric from a local thrift store in Racine, Wisconsin. It is in excellent condition and appears to have been only recently donated. I tend to shy away from really bright fabrics, especially prints because of my dark skin tone. I have no plans for this piece yet. But I will be making a spring dress of some kind. There is 4 yds. of fabric here, so there’s a lot I can do with it. 5. The green, pink, and orange floral cotton fabric, I purchased this at Hobby Lobby. It was about $4.20 yd. with a 40% off coupon. I purchased 3.5 yds. of this fabric. I want to use this fabric to make a sheath dress of some kind. I do not have a specific pattern in mind, but it will most likely be a vintage Simplicity or McCall’s pattern. 6. The Black, burgundy, and tan African Ankara Print is probably one of the most expensive purchases I have made on fabric in 2017. I purchased this fabric from an EBay Seller. Ankara prints are not cheap, unless you purchase the Hi-target Ankara from China, you are looking at $6-20 yd. for this kind of fabric. I paid about $7 yd. for this piece. Ankara fabrics are wax print fabrics. The wax is woven into the cotton; this technique is used to maintain the vibrant colors of the garment. Although I love Ankara fabrics, I do not have many of them because they are so pricy. However, whenever a family member or friend gives me money or gift cards for my birthday and/or holidays I like to purchase several yards of an African Ankara print.I plan to use the Burda Style pattern B6452 for this fabric. 7. The Red, pink, and green floral fabric was probably one of the best deals I’ve gotten from Hobby Lobby. This fabric was on clearance and priced at $2.00 yd. It is a Keepsake Calico print. It very much reminds me of The Butterick B6217 pattern by Gertie. So, I will use this fabric to make the Gertie pattern. I purchased 3 yards of this fabric. 8. The Green and magenta fruit print fabric was given to me by a dear friend about 10 years ago. I had a total of 6-8 yds. at the time. I made a table cloth and some curtains with about 3 or so yards. I now have 4 yards of this fabric remaining. I have decided to make a little summer fruit dress with it. It is 100% cotton material, although I do not know the quality of the fabric. It is a medium weight cotton and appears to be very durable. 9. The yellow and blue Ankara African print, I purchased this fabric from the same EBay Seller as I did with my other African prints.. Although I love the print of the fabric, it is a little too bright. But I would still make a garment from this material. I think I am going use a blue Kona cotton fabric for majority of the garment, and use this yellow and blue Ankara print as a contrast. 10. The red, black, and yellow Ankara African print, I first saw this print on Etsy; I fell in love with it immediately. I also did a google search for Ankara dress styles and saw an image of a beautiful dress made with this print. This made me love this print all the more. I purchased 4 yards of this print on EBay. It was about $7 a yard, which is over my fabric price limit. I generally do not pay no more than $5 a yard for fabric. On occasions, I will spend more, but not likely. I want to make either a nice vintage peplum jacket and pencil skirt or a vintage style Betty dress. Since the colors are a somewhat bright, I think I am going to use a black Kona fabric for the main part of the garment, and use the Ankara print for the jacket’s peplum and skirt’s flounce. I really think that will not only add a really nice contrast to the garment, but it will also mute the bright colors. As I mentioned previously, I have a lot of fabric, too much to show on this one blog post. These are just a few of my favorite fabrics that I have collected over the past several years. I will make another fabric haul post later this year. I am not going to commit to using these fabrics this year because I have so many fabrics that I want to use. However, I will be very surprised if I did not make at least two garments with the above fabrics. Stay tuned for more updates on my sewing projects and upcoming fabric hauls and sewing tips.